How do plants "know" it is time to flower? For a long time, no one has identified the cells which produce the small protein called Flowering Locus T (FT). A new study conducted by researchers from Cornell University uncovers exactly where the key protein forms before it triggers the flowering process in plants. Flowering in many plants begins when the leaves perceive day-length. It was previously known that in Arabidopsis plants, long day-length starts a process where leaves synthesize and transmit FT in the plant's vascular tissue, which carries sugars and nutrients from leaves to the rest of the plant. FT travels to the shoot apex, the highest point of new leaves and stems, where it promotes the formation of flowers. Flowering regulation is complex as the release of FT is controlled by more than 30 proteins in interacting cascades. Identifying FT-producing cells was difficult because leaf veins are very small and covered by photosynthetic cells rich in chlorophyll. The researchers discovered that FT was also produced in the same type of companion cells in the phloem of Maryland Mammoth tobacco. When these companion cells were killed, it delayed flowering in both Arabidopsis and the tobacco plants. When the researchers looked more closely at the pathways that lead to flowering, they found that killing these companion cells stopped FT's downstream process, but not its upstream, confirming that FT originates in these cells and that the synthesis of FT is regulated by an extensive intercellular signaling system. Read more about this research in the Cornell Chronicle. Researchers from the U.S. Department of Energy's Brookhaven National Laboratory revealed the biomolecules that can put brakes on oil production of plants. When these biomolecular brakes are disabled, oil production could be boosted which may lead to more biofuels and plant-derived bioproducts. The results of the study are published in Plant Physiology. "It's normal for plant cells to down-regulate oil production when we feed them excess fatty acids, and this study confirms our hypothesis about how they do that. But we also discovered that the brakes on oil production are partially on even under normal conditions, which was a big surprise," said John Shanklin, a biochemist and leader of the study. "It would be like driving a car for several years and finding out one day that a parking brake you didn't know about had been on all along. When you remove that brake, the car has much more power; that's what we've just discovered for plant oil production," he said. The study puts the spotlight on the enzyme that determines the rate of oil production. The enzyme, known as ACCase, is a protein made of four subunits, all of which are necessary for the enzyme to function. The researchers suspected that disabling the genes that code for the inactive subunits would turn off the off-switch for oil production, allowing the plant cells to make more oil. When they tested this idea by feeding the plant cells excess fatty acids, that's exactly what happened: Cells with combinations of the disabled genes didn't turn off oil production the way cells with the normal genes did. This implies that, even under normal conditions, inactive subunits are putting the brakes on ACCase, reducing its activity and limiting oil production. "Disabling the genes for those inactive subunits is like taking the brakes off the car, revealing the motor's true potential," Shanklin said. Read the media release from Brookhaven National Laboratory. Several studies have been conducted to know the views of consumers regarding genetically modified (GM) crops, while the attention given to the perceptions of farmers about GM crops has been limited. Thus, Carla Almeida and Luisa Massarani, researchers from Oswaldo Cruz Foundation in Brazil, investigated the perceptions of Brazilian farmers on GM crops. Results of their survey were compared with the findings of other research on farmer perceptions on GM crops. They found that there is a complex variety of views on GM crops among farmers. Despite this diversity, variations in such views occur within limited parameters, concerned principally with expectations or concrete experiences regarding the advantages of GM crops, perceptions of risks associated with them, and ethical questions they raise. The researchers proposed a classification of prevailing profiles to represent the spectrum of perceptions of GM crops among farmers. Read more from the research article published in Public Understanding of Science. Scientists from the Commonwealth Scientific and Industrial Research Organisation (CSIRO) have confirmed the hybridization of two major pest species into a new and improved mega-pest in Brazil. The evidences of the hybridization are discussed in a paper published in the Proceedings of the National Academy of Sciences of the USA. One of the pests is cotton bollworm, which is widespread in Africa, Asia, and Europe costing losses worth billions of dollars annually. It had developed strong resistance against all the pesticides used to control it. The other one is corn earworm, a native of the Americas and had less resistance and host range. The combination of the two, in a novel hybrid with unlimited geographical boundaries, causes for major concern in agriculture. Through the study, the scientists confirmed that among the group of caterpillars observed, every individual was a hybrid. "No two hybrids were the same suggesting a 'hybrid swarm' where multiple versions of different hybrids can be present within one population," said CSIRO Scientist Dr. Tom Walsh. According to Dr. Craig Anderson, lead author of the study based at the University of Edinburg in the UK, the hybrid study has wide-ranging implications for the agricultural community across the Americas. "On top of the impact already felt in South America, recent estimates that 65 per cent of the USA's agricultural output is at risk of being affected by the bollworm demonstrates that this work has the potential to instigate changes to research priorities that will have direct ramifications for the people of America, through the food on their tables and the clothes on their backs," Dr. Anderson said. For more details, read the article from CSIRO. Researchers at the RIKEN Center for Sustainable Resource Science (CSRS) in Japan have discovered a small hormone that helps plants retain water even when none is available in the soil. The study, published in Nature, shows how the peptide CLE25 moves from the roots to the leaves when water is scarce and helps prevent water loss by closing pores in the leaf surface. The team at RIKEN CSRS wanted to find out if plant hormones respond to abiotic stress. They looked at CLE peptides that are synthesized in the roots, and at abscisic acid (ABA), a hormone that accumulates in the leaves and help close pores in response to drought. Applying many CLE peptides to plant roots showed that only CLE25 led to increased ABA in the leaves and pore closure. The team concluded that the link between these two events was the increase in an enzyme necessary for making ABA. They also observed that CLE25 levels increased in the roots of plants subjected to dehydration stress, leading to the same results. To determine if CLE25 moves through the plant circulatory system, the team used high sensitive mass spectrometry system, and developed a screening system that can identify movement of the mobile peptides from root to shoot. The researchers were able to tag CLE25 molecules and observed their movement from the roots to the leaves, indicating that it was indeed a mobile hormone and that it likely interacted with other molecules in leaf to produce ABA. Before investigating how CLE25 induces ABA synthesis once it arrives at the leaf, the team created mutant plants that lacked CLE25 or ABA and performed several control experiments that confirmed their findings. After only three hours of dehydration, plants without CLE25 already showed 7 times less leaf ABA and had lost more water than control plants. Finally, the team examined several mutants and discovered that BAM1/BAM3 receptors in leaf were the link between CLE25 and ABA production. For more, read the press release at the RIKEN CSRS website. A research group from Nagoya University and Tohoku University has discovered new compounds that can control stomatal movements in plants. The research team found compounds that show stomata closing activity, which is expected to be useful for drought tolerance to suppress withering of plants, and also stomatal opening activity, which would lead to increased carbon dioxide uptake by plants. Regulation of stomatal openings is essential for plant growth as well as survival in response to various environmental conditions. Stomata consist of a pair of guard cells and open in response to the blue light present in sunlight. Opening of stomata leads to carbon dioxide uptake, explaining why photosynthesis occurs during the day. When plants are under dark conditions (night) and/or drought stress, the plant hormone abscisic acid (ABA) is biosynthesized and induces stomata closure to prevent water loss from the plant. Using the herb Benghal dayflower as a model plant, the research team screened over 20,000 compounds. They managed to find hit compounds after a year of random screening. They found 9 compounds that suppress light-induced stomatal opening by more than 50%, and 2 compounds that induce stomatal opening even in the dark. "This was the best moment in our research, to find that the molecules that we had discovered had an effect on suppressing the withering of leaves," says study leader Professor Toshinori Kinoshita. "The fact these compounds induce stomatal closure by a different mechanism to the plant hormone, ABA is important." For more, read the news release from Nagoya University. A new collaborative project between the University of Helsinki and the French National Centre for Scientific Research (CNRS) aims to shed light on the efficacy of environmentally friendly RNA-based vaccines that protect plants from diseases and pests. Dr. Minna Poranen of the Molecular and Integrative Biosciences Research Programme at the University of Helsinki's Faculty of Biological and Environmental Sciences leads a research group that is developing a plant vaccine against pathogens using double-stranded RNA molecules that can be sprayed directly on the leaves. The vaccine triggers RNA interference, an innate plant defense mechanism against pathogens. The vaccine can be targeted to the chosen pathogen by using RNA molecules which share sequence identity with the pest's genes and prevents their expression. The double-stranded RNA molecules do not affect the expression of genes in the protected plant, but only target the plant disease or pest. Poranen's group, together with researchers at the CNRS, has developed a new production method for double-stranded RNA molecules. The method uses the RNA amplification system of a bacteriophage and the RNA production takes place in bacterial cells. This new method will enable the effective production of RNA-based vaccines and promote the development and adoption of RNA-based plant protection methods. For more, read the press release from the University of Helsinki. Two friends from Amsterdam, Netherlands with opposing views on genetically modified organisms (GMOs) investigated the truth behind biotechnology which was filmed into a documentary titled "Well Fed." Ryan Tipps, AgDaily's Managing Director, discussed his take on the documentary in an article. The story revolved around the journey of Hidde Boersma, a pro-biotech scientist, and Karsten de Vreugd, a biotech critic, who traveled from Netherlands to England and then to the Bt brinjal (eggplant) farms in Bangladesh. According to Tipps, the documentary is an honest look at the perceptions, the needs, and the stakeholders experiences. De Vreugd wanted to be enlightened about the technology by seeing GMOs in action. 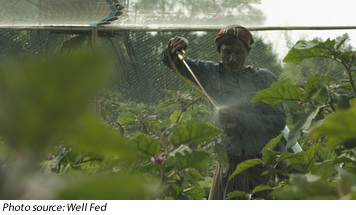 Thus, most of the film was captured in Bangladesh, one of the developing countries adopting biotech crops. After exploring the experiences of the farmers before and after Bt brinjal adoption, it was concluded that the influence in Bangladesh is less corporate and more centered on non-governmental organizations. The film ended with a statement from environmentalist Mark Lynas explaining the possible consequences of banning GMOs, which includes difficulty in proving food for the hungry children and making farming sustainable. Watch the film in Dutch (with English subtitle) and read the review in AgDaily. 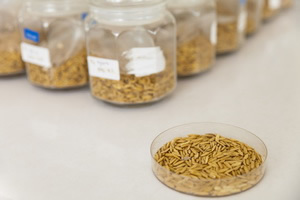 A new study conducted by a research team from John Innes Centre (JIC) has isolated a gene that controls the shape and size of wheat spikelets. The study focused on the genetics behind a specific mutant trait in bread wheat known as paired spikelets, where a wheat inflorescence is formed of two spikelets instead of the usual one. This trait, which bears resemblance to flower production in corn and rice, is a variation that could lead to increase in yield. Using a range of techniques, researchers investigated wheat lines that display paired spikelets, derived from a mapping population called a multi-parent advanced generation intercross (MAGIC); a population of spring wheat created as a tool to study and identify the genetic origins of relevant traits. The study revealed a gene called TEOSINTE BRANCHED1 (TB1) regulates wheat inflorescence architecture, promoting paired spikelets through a mechanism which delays flowering and reduces the expression of genes that control the development of lateral branches called spikelets. 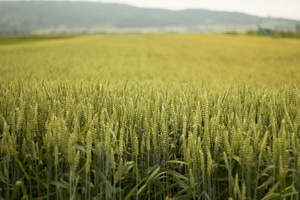 Analysis showed that alleles modifying the function of TB1 were present in a wide range of major modern wheat cultivars used by breeders in the United Kingdom and Europe; and that variant alleles for TB1 were present on two of the three wheat genomes of winter and spring wheat. Genetic analysis also showed that TB1 is linked to another gene that has been known for a long time: the so-called Green Revolution gene, Rht-1, which controls plant height. The study authors say that this information on TB1 gene is also an important contribution to possible floral architecture diversity in a number of other cereal crops including corn, barley, and rice. For more details, visit the JIC News and Events. Rice blast disease caused by Magnaporthe oryzae is the most devastating disease of rice. Previous studies have identified a terpene synthase gene, OsTPS19, as a candidate defense gene. The team of Xujun Chen from China Agricultural University studied OsTPS19, which was found to be upregulated by M. oryzae infection. The team found that overexpression of the OsTPS19 gene in rice plants enhanced the plants' resistance against rice blast. On the other hand, OsTPS19 RNAi-silenced lines were found more susceptible to the disease. Further analysis also revealed that the production of a monoterpene (S)-limonene was increased in OsTPS19-overexpressing lines while it decreased in RNAi lines. This indicates that OsTPS19 functions as an (S)-limonene synthase in rice and plays a partial role in defense against M. oryzae. Many studies suggest that GRAS transcription factors act as regulators in plant growth and development as well as in response to biotic and abiotic stresses. While several GRAS proteins have been identified, only a few have been studied in tomato (Solanum lycopersicum). Chongqing University's Shengen Zhou led a team of scientists and studied a novel GRAS transcription factor SlGRAS26, in hopes of learning about its roles in tomato. Downregulation of SlGRAS26 resulted in transgenic plants with reduced plant height with more lateral shoots, accelerated flowering transition, and decreased trichome number. Analysis revealed that downregulation of SlGRAS26 altered tomato's vegetative growth by suppressing gibberellin (GA) synthesis genes and activating the GA-inactivating genes, resulting in reduced endogenous GA content in the transgenic plants. These results suggest that SlGRAS26 may play a role in the initiation of lateral and inflorescence meristems in tomato. In genome editing tools such as CRISPR, it is beneficial if no foreign DNA is integrated into the genome. Mariette Andersson and her colleagues from the Swedish University of Agricultural Sciences in Sweden used a DNA‐free genome editing method using CRISPR-Cas9 ribonucleoproteins (RNP) to target the granule bound starch synthase gene (GBSS) in potato (Solanum tuberosum) protoplasts. The RNP method was done using previously developed protoplast isolation, transfection and regeneration protocols. The Cas9 protein to be used was designed using RNA produced either synthetically or by in vitro transcription. RNP with synthetically produced RNA induced mutations at a 9% frequency, with all mutated lines being transgene‐free. A mutagenesis frequency of 25% of all regenerated shoots was found when using RNP with in vitro transcriptionally produced RNA. However, shoots with confirmed mutations had unintended DNA inserts. The inserts originated both from DNA template remnants from the in vitro transcription and from chromosomal potato DNA. In the regenerated shoots from the RNP‐experiments, mutations were induced in all four GBSS alleles resulting in a complete knockout of the enzyme's function. For more information on this study, read the article in Physiologia Plantarum. Strigolactones (SLs) are phytohormones that regulate plant architecture. Carotenoid cleavage dioxygenase (CCD) genes are involved in the biosynthesis of these SLs and are characterized in many plants. However, the function of CCD genes in tobacco remains poorly understood. Junping Gao of the Southwest University in China studied two CCD genes, NtCCD8A and NtCCD8B, in tobacco (Nicotiana tabacum). The two NtCCD8 genes are orthologs of the tomato (Solanum lycopersicum) carotenoid cleavage dioxygenase 8 (SlCCD8) gene. NtCCD8A and NtCCD8B were revealed to be primarily expressed in tobacco roots, but low levels of expressions were detected in all plant tissues. Their expressions were also found to be significantly increased in response to phosphate limitation. Using the CRISPR-Cas9 system, mutations were induced in NtCCD8A and NtCCD8B in tobacco to develop ntccd8 mutant lines. The ntccd8 mutants had increased shoot branching, reduced plant height, increased number of leaves and nodes, and reduced total plant biomass compared to wild types. The mutant lines also had shorter primary roots and more lateral roots. These results suggest that NtCCD8 genes are involved in tobacco plant architecture. For more information, read the article in International Journal of Molecular Sciences. Camelina (Camelina sativa) is a low-input oilseed crop that has great potential. However, it is necessary to upgrade camelina oil to meet application requirements since it contains significant amounts of very long-chain fatty acids (VLCFAs). The team of Mehmet E.Ozseyhan from Montana State University in the US aimed to reduce VLCFAs by deactivating the Fatty Acid Elongase1 gene (FAE1) in camelina. The allohexaploid camelina contains three alleles of FAE1 genes. Knockout mutants were successfully developed in a single generation by simultaneously targeting these three FAE1 alleles using the CRISPR-Cas9 technology. VLCFAs were reduced to less than 2% of the total fatty acids compared to over 22% in the wild types. The fae1 mutants were also indistinguishable from wild type in seed physiology and plant growth. This study demonstrates that the CRISPR-Cas9 technology is applicable to camelina to obtain desired traits in its seed oil. The study also provides an approach to increasing the levels of oleic acid or α-linolenic acid in camelina oil, which are also desirable for industrial or food and feed uses. For more information, read the article in Plant Physiology and Biochemistry. Rice tungro disease (RTD) is a serious threat in rice production. RTD is caused by the interaction between Rice tungro spherical virus (RTSV) and Rice tungro bacilliform virus (RTBV). Natural RTSV resistance is a recessive trait controlled by the translation initiation factor 4 gamma gene (eIF4G). To develop new sources of resistance to RTD, the team of Anca Macovei of the International Rice Research Institute in the Philippines induced mutations in eIF4G using the CRISPR-Cas9 system in the RTSV‐susceptible variety IR64. The mutation rates ranged from 36.0 to 86.6% and the mutations were successfully transmitted to succeeding generations. Among the mutated eIF4G alleles examined, only those resulting in mutations in SVLFPNLAGKS residues conferred resistance. From these, the team developed lines with RTSV resistance and enhanced yield under greenhouse conditions. These developed lines no longer contain the Cas9 sequence. These CRISPR-developed RTSV‐resistant plants with the novel eIF4G alleles represent a valuable material to develop more resistant rice varieties. For details on submission of abstract and registration, visit the IBS 2018 website. Read the brochure below for more details. Register now by filling out this form. The ILSI Research Foundation offers a suite of eLearning courses related to biosafety and biotechnology, delivering training in an accessible, interactive format. Available to regulatory agencies, the private sector, and academics, our modules provide in-depth information about the risk assessment process of confined field trials and the application of problem formulation to safety assessments of GE Crops. To register, got to ILSI website.